Romans take their football seriously. 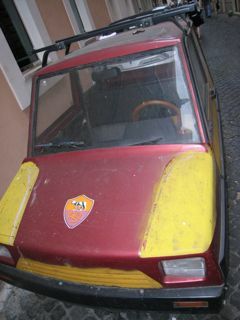 This car, seen the other day near the Pantheon, is decorated with the colors of the AS Roma soccer team, also called the Giallorossi — yellow & red. On the other hand, visitors to Rome sometimes take a different view of the local team, and even in Rome some are fans of the Lazio team, with all the enthusiasm of local rivals. 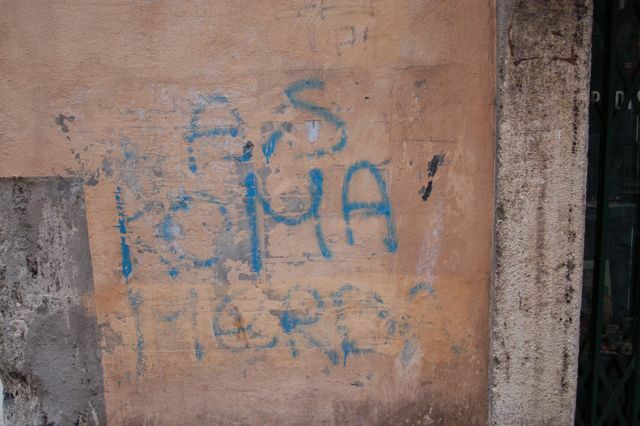 The graffiti, “AS Roma Merda” is written in blue paint, the color of the Lazio team. For American (or any) fans of Italian soccer and Italian culture, I recommend Tim Parks, A Season with Verona, an account of Parks’ year following the fans of the Verona team around Italy.